People diagnosed with early-stage breast cancer have a five-year survival rate of more than 93 per cent. However, one problem that has eluded health professionals is identifying high-risk cancer patients amongst those already diagnosed with early-stage breast cancer. 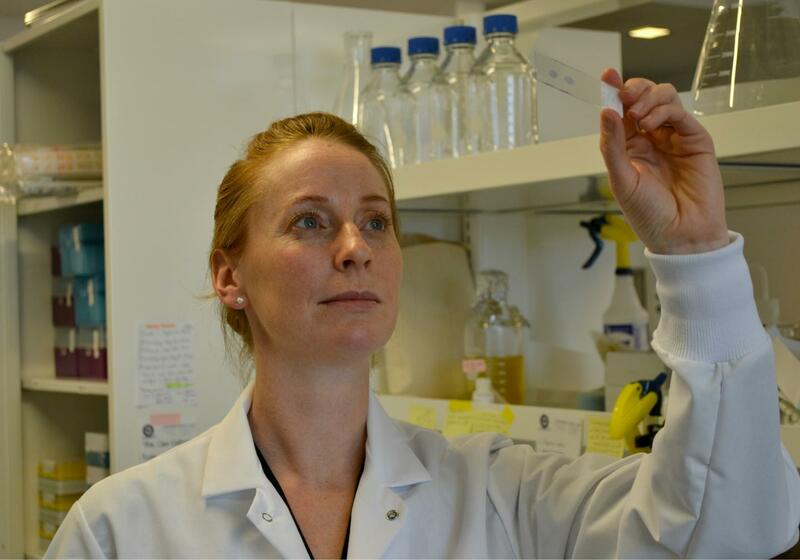 GlycoNet network investigator Karla Williams is using carbohydrates (sugars) to shed more light on this issue. Williams, an assistant professor at the University of British Columbia (UBC), is using a sugar found on aggressive cancer cells surface that acts as a biomarker to detect high-risk cancer in patients. "Right now, with early-stage breast cancer, diagnostics can't really tell us who needs aggressive treatment such as chemotherapy or radiation and who doesn't need it," says Williams, who received GlycoNet translational grant funding for this two-year project. "Our research has identified a specific sugar that is only present on aggressive cancer cells." Williams goal is to develop a blood test to use alongside current diagnostics to detect whether these cancer cells are aggressive and likely to spread further. "We are trying to fulfill a clinically unmet need," she says. "This blood test would give information to the clinician who could then direct the proper treatment based on the test results and the pathology together." Williams says a blood test to detect this sugar as a biomarker has several benefits including being less invasive than surgery and reducing the need for unnecessary chemotherapy or radiation treatments. "In some cases, we're sending people for expensive and stressful cancer treatments that they simply do no need to have," says Williams. "This test will detect whether or not someone has elevated levels of the glycan on the breast tissue and if they do, the clinician can suggest a strict course of treatment. If the glycan is absent, the patient could have the lump removed, completely bypassing radiation and chemotherapy." GlycoNet funding is allowing Williams to collaborate with pathologist Dr. Peter Watson from the BC Cancer Agency, to gather tissue specimens and blood for analysis in her UBC lab. "Specimens are expensive to obtain, so the GlycoNet funding puts people like myself and Dr. Watson together to work on a solution," she says. "It brings both the clinical and research side together which makes for a nice strong foundation to advance the research." Armed with matching funding from the US Department of Defense, Williams is also exploring the biology of the glycan biomarker. "We don't know a lot about this type of glycan in breast cancer and so, we need to study it more," she says. "What we do know is that a cancer tumour will release debris of itself in the bloodstream and this specific sugar is present in these debris." Williams explains these debris, called extracellular vesicles, contain the same proteins and glycans as the tumour so a simple blood test could determine if this particular glycan is present without ever having to touch the tumour. Williams believes this blood test would provide improved information for all patients diagnosed with early-stage breast cancer. She says having more information will allow the patient to confidently say they do not need treatments or that chemotherapy and radiation treatments would definitely benefit them. "When someone is told they have a lump in their breast, there is a lot of emotional stress and concern," says Williams. "Our hope with this research is that we can build a blood test which will give meaningful information to clinicians to provide the appropriate treatment for the patient." Williams' project builds on results from a previous GlycoNet-funded project that she worked on alongside fellow investigators, Dr. Hon Leong, Dr. Lisa Willis and Dr. Mark Nitz. The project looked at the potential for carbohydrates as a biomarker to detect prostate cancer. An Alberta-based spin-off company, GlyCa BioSciences Inc, was created to translate and commercialize the technology. "We're pleased to support this project in the next stage of its development," says Todd Lowary, scientific director, GlycoNet. "Dr. Williams has taken an innovative approach to expanding the use of this glycan biomarker to detect other forms of cancer and this will fill an urgent need in the medical community."